Olympia Equine Ventures, LLC offers a more one on one based riding program that will help your rider grow at a more rapid pace. We start with private lessons to get to know your riding ability as well as allow you to get to know our teaching style. We want to create horse people not just riders, so your first lesson is spent learning the equipment, the care of the horse, handling of the horse as well as safety in the barn. As you progress in your riding you may move to a semi-private group if you would like. Our groups are never over 3 in order to maintain the highest level of learning as possible. Our private lessons run 30 - 45 minutes and our semi-private lessons 45 minutes to 1 hour. 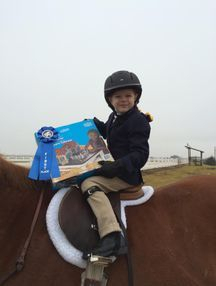 We teach Beginner Level riders up to the Grand Prix Level. Our program operates 7 days a week and year around. We have a variety of school horses that can help you learn to be the best rider you can be. OEV will now be offering video reviews from lessons or horse shows for $20.00 for a half hr session. Contract Brittany for more details! The OEV price sheet in it's entirety can be read here.